This is my End-Of-Term post for 2014, before taking a short break over the summer to do Stuff™, and so I have chosen a cake that has been on my ToDo list for many a moon. Miss Maudie Atkinson baked a Lane cake so loaded with shinny it made me tight. Miss Maudie later decides that a Lane Cake is in order when a neighbour is hurt on the night Miss Maudie’s house catches fire. Over the years, the Lane Cake has suffered several adulterations and been added to and embellished like a baking Pass The Message game, and what is now purported to be a Lane Cake is frequently a far cry from the prize-winning original. The original cake is deceptively simple: a sponge cake made with egg-whites and a dazzlingly white meringue frosting. The star, however, is the filling: a rich, sweetened egg-curd studded with raisins and shimmering with alcohol, in this case brandy although whiskey is another option. I love the fact that, not only was the Lane Cake a special occasion cake, it was also a nineteenth century humble-brag. Refined Southern ladies would not be so coarse as to boast about their baking skills *pauses to sink gracefully onto a nearby chaise-longue and flutters fan coyly* but it would be patently obvious to anyone with any baking ability just how impressive a Lane Cake was in terms of demonstrating the baker’s skill. Not only were there few gadgets for whisking eggs and creaming butter/sugar to ensure an airy sponge, the ovens were unpredictable in terms of both strength and duration of heat. Making the filling without curdling the yolks or the frosting without burning the sugar was impressive indeed. I wouldn’t be surprised if the cook treated herself to a decent glug of shinny herself – with all that stress she’d have earned it! I really like the contrast between the simplicity of the cake and frosting and the gutsy richness of the filling. I think the original recipe needs nothing adding to it – it’s delicious just as it is – although additions over the years have included coconut, cherries, pecans etc. Gilding the lily, in my opinion. To my mind it’s akin to someone ‘improving’ Chanel’s Little Black Dress until it resembles Carmen Miranda, complete with fruit hat. Nevertheless, there’s a couple of things that will need your consideration/decision-making when making this cake. Exactly as written, the cake is a little on the firm side. Personally I like it because of the contrast in texture between the filling, the cake and the frosting. Additionally, it makes for a more stable cake during assembly. However, if you’d like to have a lighter texture, consider whisking the egg-whites separately to stiff peaks, then folding them gently into the cake mixture after adding the flour and the milk. Your call. Also, the cake doesn’t have any flavouring as such. Creamy milk, rich butter and fresh eggs should be sufficient, however, if you prefer your cakes to have a definite flavor, then add 1tsp vanilla extract to the batter. Due to the liquids added after cooking, the filling might need a little help in order to stay a ‘filling’ and not become an ‘oozing out and dripping down’. You can add more yolks, or consider making the mixture thicker and more of a custard by adding a little cornflour mixed with water and cooking it until thick. Emma Lane recommends letting the assembled cake stand for a day or two before cutting, and this would enable any extra liquid to be absorbed by the sponge layers, however you would need to wrap the cake firmly in cling film or an acetate band in order to keep the filling between the cakes long enough to firm up. Alternatively, thicken with cornflour and then drizzle the cake with a little extra alcohol to moisten just before assembling. This is the original Lane Cake recipe but for one fact: it’s half the size. The original recipe called for the mixture to be shared between four cake pans, which I don’t have. Now I know I could have used 2 tins and then split each cake horizontally, but I also don’t have a large enough audience to consume said cake once assembled. Making it just a two-layer cake is still an impressive-but-manageable size, and can also be easily scaled up should the occasion arise. Pre-heat the oven to 180°C, 160°C Fan. Grease two 20cm sandwich tins. Cut a circle of baking parchment for each one and line the bases. Set aside. Beat the butter until light and fluffy, then add the caster sugar and beat for a further 5-10 minutes until pale and fluffy. Add the egg-whites one at a time. Beat well in before adding the next. Add the milk and flour mixture alternately until fully combined. Divide the mixture evenly between the prepared baking tins and smooth. Bake for 20-25 minutes, until the cakes are risen and golden brown and have begun to shrink away from the sides of the pans. Leave the cakes to cool in the tins for 5 minutes. Turn the cakes out onto a wire rack and remove the sheet of baking parchment. Gently turn the cakes the right way up and leave to cool completely. Put the yolks sugar and butter into a pan and stir together over a medium heat until quite thick. Remove pan from the heat and add the chopped raisins, alcohol and vanilla. Cover with cling film and set aside to cool. If the filling is too runny when cold, consider using one of the options mentioned above to rectify. In a standing mixer with a whisk attachment, whisk egg whites until foamy. Add cream of tartar and lemon juice and continue whisking on medium-high speed until soft peaks form. With the whisk running, slowly add the 20g of caster sugar in a steady stream. When the egg whites reach stiff peaks, stop the whisk until the syrup is ready. In a heavy saucepan, gently heat the 100g of caster sugar and water, swirling the pan until the sugar is dissolved. NB Don’t stir, or the sugar will crystallise and you will have to start again. Turn the heat to high and cook the syrup until the soft ball stage on a sugar thermometer (115°C). NB Youmay have to tilt the pan in order to make the syrup deep enough for the sugar thermometer. Remove the pan from the heat and wait until the syrup has stopped bubbling. If you’re not confident about pouring boiling syrup from a hot pan one-handed, pour the syrup into a plastic jug. Switch the whisk to medium speed and slowly pour the cooked sugar into the stiffly beaten whites. NB This is the tricky part. If you are pouring the syrup straight from the pan, be sure your oven gloves are thick enough so that your hand is fully protected. Pour the sugar syrup in a steady stream so that it hits the side of the bowl just above the point where the beaters meet the side of the bowl. This will achieve 2 things: the syrup will cool and this will help avoid cooking and/or curdling the egg-whites and the beaters won’t get covered in sticky syrup. Once all the syrup has been added, continue beating the egg-whites until the outside of the bowl feels cool. This will take between 10 and 15 minutes. Spread one cake with the cooled filling. Place the other cake on top. 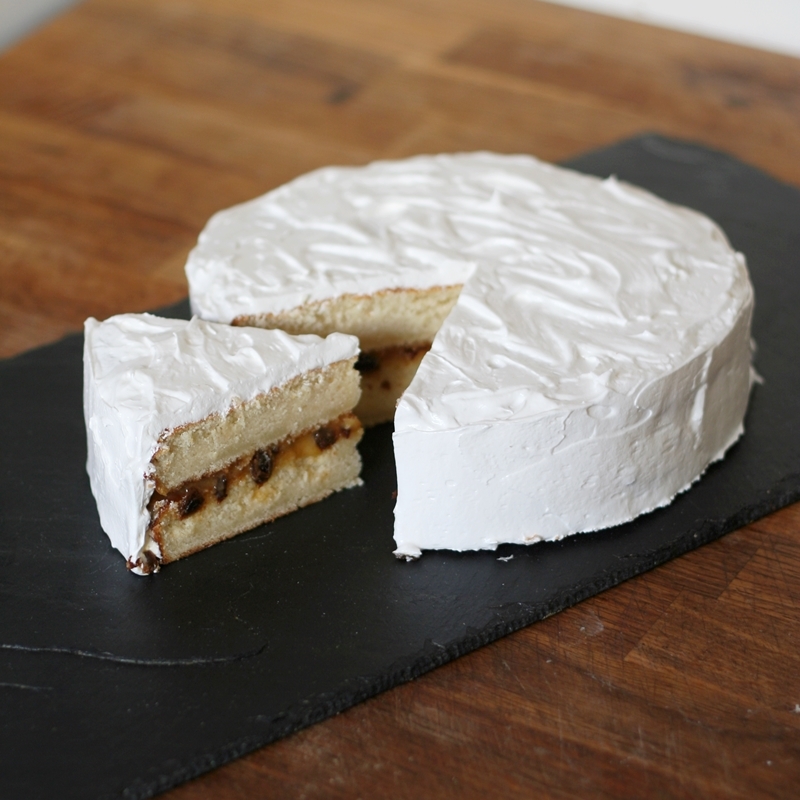 Coat the whole cake with the meringue. Leave for 1-2 days before cutting to allow the flavours to mix. If chilled, allow to return to room temperature before serving. Sifting the flour adds air, which in turn add lightness to the sponge. The quantity stated in the recipe is as a result of converting from US Cups. I might have sifted too much or too little air into the flour, so it’s more of a guideline than a hard and fast quantity. Keep some sifted flour on hand to add in case the cake mixture proves too loose. This looks like a ‘to do ‘ / thanks for sharing. Love the story behind it. Happy holidays to you! This sounds AMAZING!!! Perfect summer treat, I may just have to try this one out! Any takers for the taste testing team? What lovely history and story with this cake. It must have been a biggun at full size and a fair display of the income of the baker I reckon! What an interesting story and the cake looks so good. Enjoy your holidays.